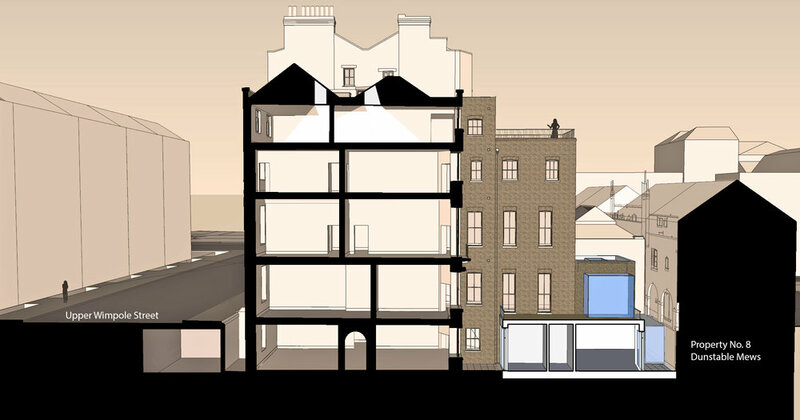 Type: Mixed use, Prime Residential, Heritage, Conversion. Size: 678 m2, 4 apartments, one medical consulting suite. This project restores and extends a Grade II listed Georgian terrace in Westminster. The scheme is now four prime residential homes and a medical consulting suite. A new lift serves three apartments on the upper floors, while a contemporary structure extends the ground and lower ground floors to create a unique duplex apartment. The design marries crisp contemporary lines with heritage detail meticulously restored to its former glory. The project provided the opportunity to upgrade the environmental performance of the building whilst retaining and reusing the existing fabric.